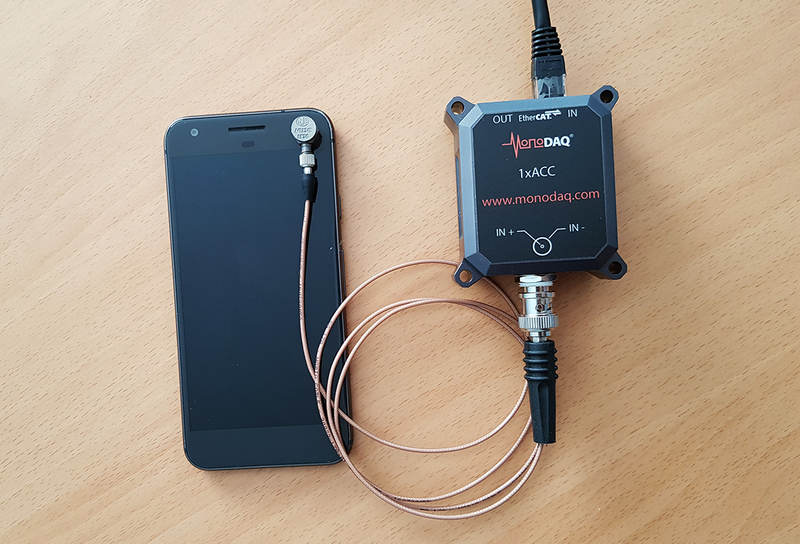 I’ve been working in test & measurement industry for a few years now and people often ask me why we sell data acquisition systems at 1000+ USD per measurement channel when a regular smartphone includes an accelerometer that you can buy online for $2. Here’s why. Take Google Pixel that’s been in my pocket for the last 12 months. Inside it is the Bosch Sensortec BMI160 IMU chip (IMU = inertial measurement unit). BMI160 utilizes the fascinating MEMS technology that integrates a triaxial accelerometer and a triaxial gyroscope on a 2.5 mm x 3 mm footprint and costs $2 at any online electronics store. It tells the phone’s processor when the phone is lying on the desk, when you pick it up, what in-game gestures you are performing and can notice and memorize freefall when you drop the phone and expect a free display repair. 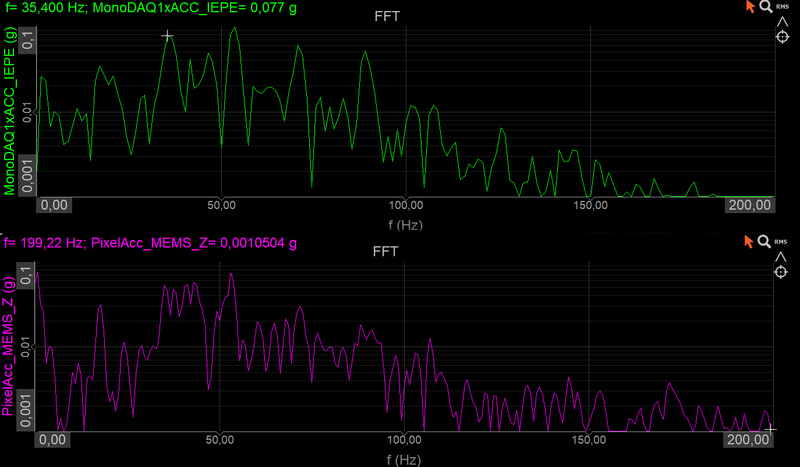 Compare that to DJB A/123 miniature IEPE accelerometer and MonoDAQ-1xACC isolated IEPE data acquisition device. Together those two devices form a professional vibration measurement system. The piezoelectric accelerometer requires a constant current power supply (excitation) from the MonoDAQ 1xACC to output varying voltage on the same wire. MonoDAQ acquires the signal with high precision and speed – up to 40 thousand times per second. This is the first big difference to the phone accelerometer coupled to Android operating system since it can only provide 400 samples of data per second – a 100x less than the data acquisition system. We have mounted the IEPE accelerometer to the Pixel phone at approximately the same position where the internal MEMS accelerometer is mounted. We put the equipped phone in the car and drove around. 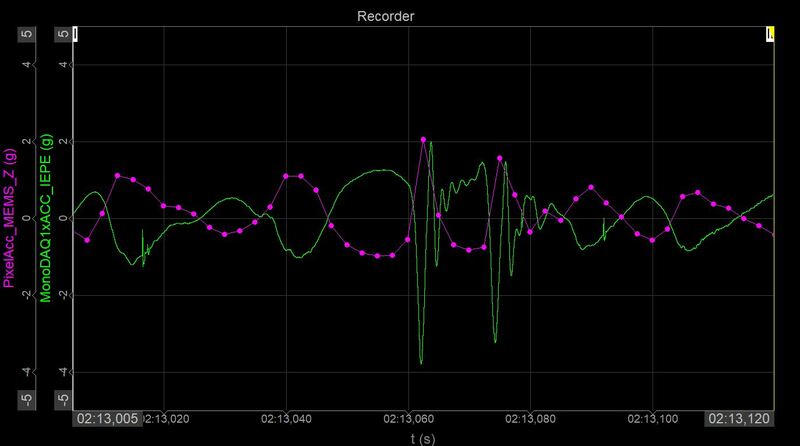 The data from the MonoDAQ device is recorded in a professional data acquisition software DEWESoft. To get the data from the phone’s accelerometer into DEWESoft, we first used the Accelerometer Analyzer app to record it into a text file and then imported it to DEWESoft. 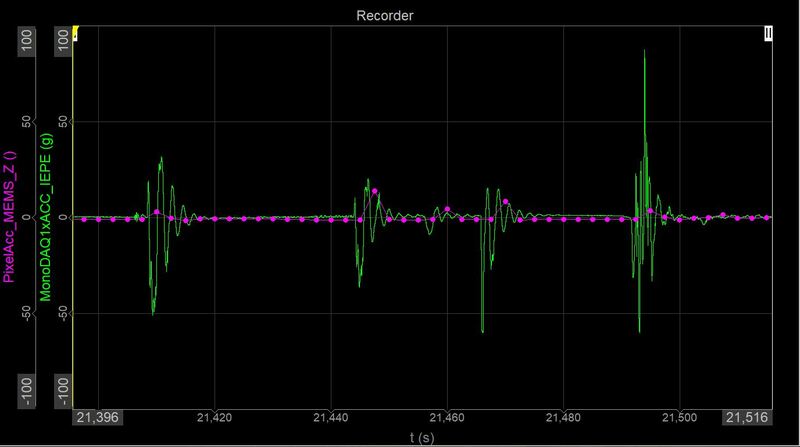 The recorder above shows data from both sensors overlaid. Note the vertical scale of +-3 g and the timespan of about 6 minutes. Quick look suggests that the low cost accelerometer fares pretty well. Indeed the calculated RMS values with the block size of 1 second agree to within 15%. When idling, the accelerometers record 0.4 gRMS, driving at 50 km/s gives 0.8 gRMS and driving on a highway gives 0.13 gRMS. Looking at the frequency spectrum from 0 to 200 Hz it is clear that the phone is vibrating at relatively low frequencies when it is in the car. That is why the phone accelerometer records similar acceleration to the IEPE accelerometer. 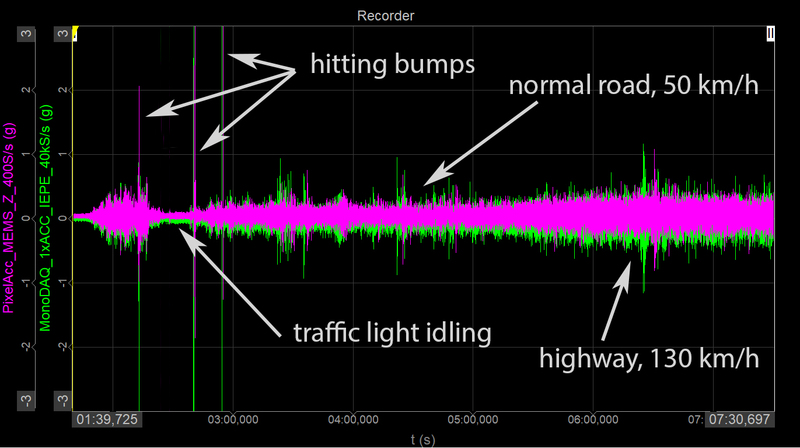 Now let’s take a closer look at the portion of data when we hit the bump on the road. The vertical scale is now +-5 g and we are zooming in the timescale so that we can see sample by sample of the slow speed accelerometer. When we hit the bump, the phone experiences much higher frequency. The limited bandwidth of the MEMS accelerometer causes it to record the peak acceleration of 2 g while we clearly see that the IEPE accelerometer recorded -4 g.
Going more into the extreme, we drop the phone on the table from just a few centimeters of height. Note that we are only showing 0.1 second of data here and that the vertical scale is +-100 g. The phone experiences 87 g during this small drop on the table! It occurs for a very short period of time therefore the energy of the impact is low so there is no harm done. The difference between the measurement systems becomes clear in this case, though. 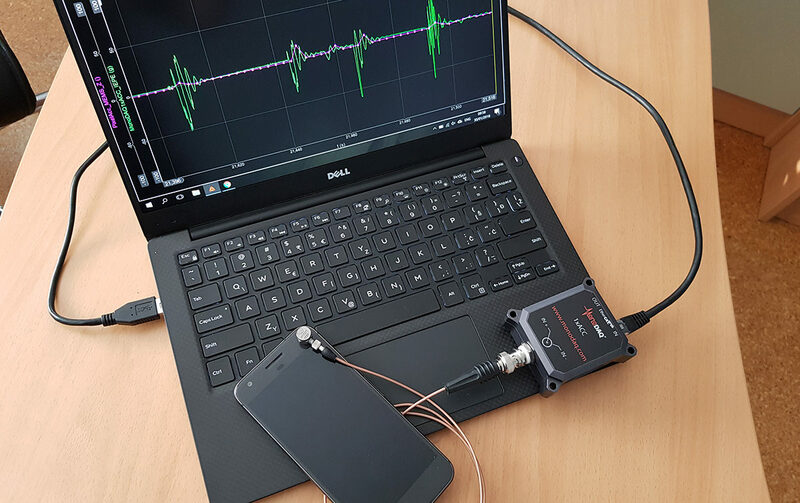 Besides limited bandwidth, the phone accelerometer is also limited to the range of +-16g, while the IEPE accelerometer can handle up to +- 100 g. The highest frequency of oscillation that we recorded with the IEPE accelerometer in this test was 2 kHz. Hopefully this comparison explains where the mass-produced MEMS accelerometers can be used successfully and in which cases there is clear need for high-end vibration measurement equipment!